Motel Albert is across the street from Club Bali Hai on Cook's Bay. It's been top rated in the budget category on Moorea for a long time. A room with a double bed (for 1 to 2 people) is 5400 (minimum stay two nights), including a kitchen and private bathroom. Larger bungalows are available including one that sleeps up to 5 for 10850. There are two supermarkets nearby, restaurants, and a gas station to purchase snacks next door. My sister and I travelled to Papeete and by motorboat over to Moorea in December 1969! The man who pilotted the boat told us about "Chez Albert" when we let him know we needed an inexpensive place to stay. You could simply walk over to beach at the Hotel Aimeo,owned by partners from Los Angeles, one of whom was engaged to a local girl. We took a room after meeting Albert, who was 51 years old at that time. He had emigrated from Switzerland with his son and daughter after his wife had passed away. At that time, his daughter was 31, married to a Tahitian man, and they worked a copra farm. I have this deeply embedded image of her, a beautiful blonde, tan woman clad in shorts, hoisting an ax to crack cocnuts on the earth, her body airborne with each swing of the ax. Toddlers (hers with their friends) roamed around playing with a small wheelbarrow on the farm and squatting on the earth when necessary..."the best toilet-training around" is what I thought. The cabins, just 6 at the time, were simple and without any kitchen, but Albert went up into the hills each morning to gather pimplemousse, the large lime-flavored grapefruits, and gifted us. Then we'd get a coffee at the Hotel. Inevitably, each night of our week, someone treated us to dinner. My sister and I couldn't recognize the taste of the meat we ate, and she would joke that we were probably eating monkey. The waiters didn't know the name in English and we didn't understand much French. In 1969, the room cost $6 US for the two of us. The only reason we got the last available cabin was that it was the week before Christmas and someone had to cancel their reservation. The other rooms were taken. It is to this day one of the brightest experiences in my life of active travel, and I cherish numerous color slides from that time. My sister and I simply swam over to the CBH, purchased some of their bead necklaces and exchanged them for refreshment. Good memories indeed! I was there inthe early 70s. I believe $10 was the "Bungalow" per day. Had the time of my life using Albert's outrigger "Barracuda" to go snorkeling. Reading these comments makes me think about my own experience. In the summer of 1963 I went alone to Tahiti and then to Moorea (I had just been diving for diamonds in the British Guiana uncharted interior and still had my 'Amazon beard'). One of the Bali Hai 'boys' was hawking, at the old waterfront in Papeete, for passengers to for a one-day excursion to Maharepa aboard a tiny boat which even had a couple of pigs aboard, over to where the "Boys" had their the first scrawny Bali Hai Hotel with external generators accompanying each of the few huts. The late Hugh Kelly was sitting on a fence strumming his guitar as the few of us partaking of this short 'excursion' entered. I was the only one who stayed on, the rest went back that late afternoon to Papeete. Later I moved over to the Hotel Eimeo in Pao Pao. But at first I was invited to stay in Albert's home on the side of the mountain. He told me he'd been in Moorea for 37 years. I asked him if he was happy that he left Switzerland all those years ago (must've been since 1926!). He pondered a bit, then replied, "No". I felt he missed his birth country. He hadn't yet started his commercial lodging. Hotel Eimeo (of course it became the Club Bali Hai many years later) was paradisaical to me. The French proprietor at that time must have thought I was an awful American 'hick' - he asked me if I knew any French words? I said, "Oui" - that was it, my total French vocabulary! Being a youthful 22 I suppose 'saved' me from consequences of such naivete. I seemed to get along quite well with the Bali Hai Boys. One of them - Jay Carlisle - told me he could build (or have built) a simple bamboo and thatch dwelling for $1200. When I finally got back to the States, I called Mr. Kelly who happened to be back in California also, visiting his parents, to take them up on the terrific offer. However, by then, Kelly said they really had too many irons in the fire, with new opportunities and expansion going on. 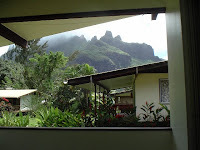 In recent years I went back to Moorea twice more. My children grew up hearing so much about this small and mighty Island only 6 miles across, that I felt I had to show them the truth of this wonderful place, and both times stayed part of the time at the Hotel Albert, which keeps improving. 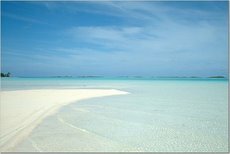 I just remember that we could walk around the island in an hour and a half at a leisurely pace, snorkelling along the way, gathering pieces of red, blue, and white coral. Ten of us from Aus, UK, US, Netherlands participated in scripting and acting out a video scene that began in one of the mandis..ha! We sure had a great time eating together each day and creating together...also lots of 4-handed massages. But no traffic lights..can't even imagine that on that pristine island. My girlfriend and I stayed at Chez Albert in 1983, partway through a round-the-world back-packing trip. Cook's Bay was the most beautiful and exotic place we came across on our entire trip, even better than Bora Bora, our next stop. Albert was fabulous, tended to our every need and told us wild stories. He was now getting on for 70 but he had a new island wife and several small children running around. He was still enthusiastically hand building new huts for rent. 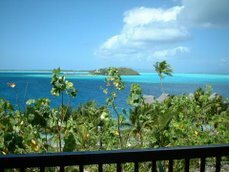 I will never ever forget Moorea, Albert and his hotel.